Sinsheim - If you’re a Brazilian and wearing a number ten on your back, then there are certain expectations. Creativity in spades, countless assists and brilliant goals should be par for the course. 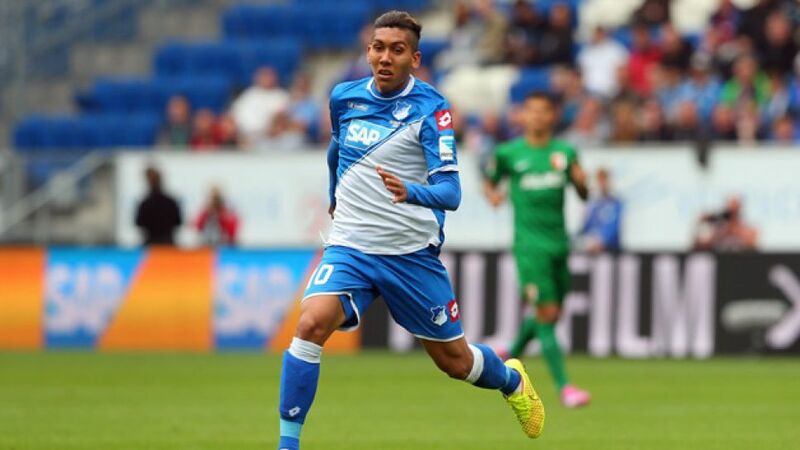 TSG 1899 Hoffenheim’s Roberto Firmino is no exception. He is, however, adding some atypically Brazilian skills to his already-impressive repertoire. Once again, on Matchday 2 against Werder Bremen, the 22-year-old showed his enormous potential, but this time at both ends of the pitch. "Roberto showed all his class to make it 1-0," praised Sebastian Rudy, who assisted the Brazilian’s opener in the 1-1 draw with Bremen. "He took the ball down with one touch and just slid it in." As already stated, however, Hoffenheim fans have come to expect such nonchalant brilliance from Firmino. What is most notable in comparison to last season is his improved defensive work. Amidst Hoffenheim’s eye-catching first-half display, one man stood out above the rest: Firmino. He was involved in everything. The attacking midfielder renowned for his delicate passing and eye for goal from a single tackle. No other player on the field contested as many one-on-one challenges. Firmino came out the victor in 46 per cent of those 32 duels - as well as winning one of his five aerial clashes. Such numbers reflect that Firmino isn’t merely a lightweight attacker with an eye for goal, but also more than capable of mixing it physically with the best of them. Not that anyone would deny that his primary qualities remain in attack. With 16 goals in 2013/14, he was rubbing shoulders in exalted company. Adrian Ramos and Marco Reus both scored the same number as the diminutive Brazilian, while only Robert Lewandowski (20), Mario Mandzukic (18) and Josip Drmic (18) managed more. Furthermore, this calendar year, only Klaas-Jan Huntelaar and Drmic (11), have more than Firmino’s nine. Such form has turned him into the cornerstone of successive Hoffenheim teams. Since he joined the club on 1 January 2011, his time in a blue shirt has been presided over by four coaches, starting with Marco Pezzaiuoli until most recently , who spectacularly saved the club from relegation in 2012/13. Since Gisdol’s arrival, Firmino has been unstoppable and undroppable. The technical game preached by the coach plays to his main strengths of passing and countering at speed. It’s almost as if the pair were made for each other. The real Brazilian number ten? The statistics back that up, too. Firmino has been directly or indirectly involved in 39 goals in Hoffenheim’s last 39 competitive games - the best such record in the league. Indeed, in 119 games for the club, the Brazilian, who stands at a mere 1.81 metres, has scored 40 goals and laid on 20 more. While many of his colleagues, including Rudy, are currently on duty for their countries, Firmino is preparing for Hoffenheim’s clash with VfL Wolfsburg at the Rhein-Neckar-Arena on Matchday 3. The Brazil national team, meanwhile, are gearing up for Tuesday’s friendly with Ecuador after beating Colombia 1-0 on Friday. If Firmino maintains his fine club form, however, new Brazil coach Dunga might find - just like Hoffenheim - that he simply can’t manage without him.